It’s official: You are now a college student! Students at the Palm Beach Gardens New Student Convocation in Meldon Hall. 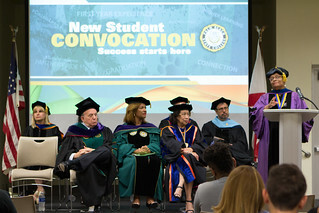 Palm Beach State College held New Student Convocation this week at each of its four campuses to officially welcome students to their academic careers. This marked the first year that the events were held during the first week of class. Barbatis also noted that having convocations during the first week of class is a way for the College community to provide encouragement to students right away, helping them to embrace their place in the College and to envision their successful academic careers. One motivational message came from William Berger, vice chair of the PBSC District Board of Trustees and attorney at Greenspoon Marder law firm, who addressed the crowd of more than 200 during the Boca Raton Student Convocation. During the ceremonies, students and their families were greeted by faculty and staff creating an experience similar to graduation. Students also heard inspirational remarks from various speakers, information on PBSC services and tips on how to succeed in college. They also recited the student pledge. The festivities included food, music and information tables about academic programs, giveaways and more. Mia Patz, an attendee at the Palm Beach Gardens convocation who is pursuing an Associate in Science degree in business administration and management, enjoyed a particular message that she says she will carry with her throughout her journey at PBSC. As of this week, Palm Beach State has nearly 5,000 first-time-in-college students. The College began holding Student Convocation five years ago as part of its new First-Year Experience program designed to help ease new student’s transition to college life. Until now, the convocations were previously held during the second or third week of class. For photos from all of the New Student Convocations, click on the image below.